I was just a kid when I discovered those black-and-white horror comic magazines like CREEPY and EERIE. If you’ve ever paged through them, you know they were a bit…edgy? The best of them featured graphic depictions of beheadings, strangulation, dismemberment, and torture. They creeped me out, but I couldn’t stop reading them. I don’t think they did any long-lasting psychological damage (I guess? ), but when I see them at comic conventions I can still feel those weird, skin-crawling shivers they gave me as a kid. A lot of that had to do with the grey-toned images. So this eerie little Bigfoot story will be presented as if it were a story in those black-and-white horror mags of my childhood. But don’t worry. It’s just slightly creepy. There won’t be any beheadings, strangulation, or dismemberment — and really hardly any torture at all. We Got Another Reuben Nomination! Talk about burying the lede. 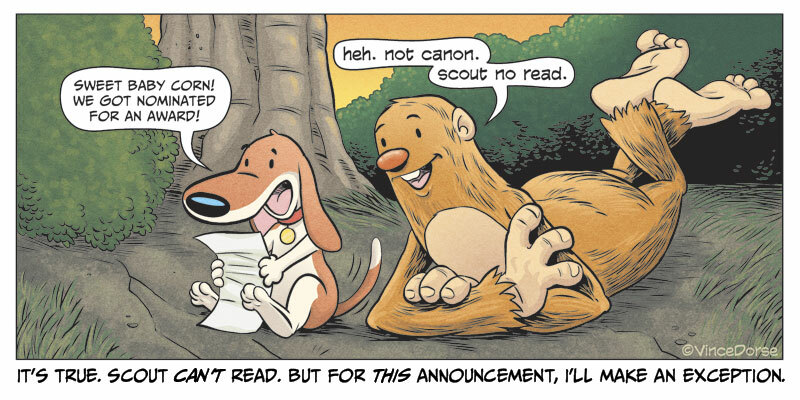 Somehow, someway, Untold Tales of Bigfoot has earned it’s third Silver Reuben nomination in the division of Online Comic: Long Form from the National Cartoonists Society. As I’ve said elsewhere, Bigfoot and I feel like the nomination itself is a win…but Scout really wants the wall plaque and won’t shut up about it. We’ll find out whether or not we take home that plaque at the 72nd Reuben Awards Weekend, May 25-27th, in Philadelphia PA. The Reubens are always a good time with good people. And regardless of the outcome of the awards ceremony, I’d like to thank all of you folks who have enjoyed the comic and purchased the book. Your enthusiasm for the project helps fuel my own. Saturday, May 5th is Free Comic Book Day, where you can walk into just about any comic shop and walk out with a bunch of free stuff! This May 5th, I’ll be sharing a table with Jim Rugg (Street Angel, Afrodisiac) at Phantom of the Attic in Oakland. I’ve done Free Comic Book Day at this amazing comic shop before and had a blast meeting people, selling books, and doing quick commission sketches. It’s a wonderful shop with a great staff and it’s stocked floor to ceiling with fun. If you’re in Oakland that Saturday, stop by for the festivities! I did this con last year, had a great time, and so I’m doing it again this year. Saturday and Sunday, May 19-20, I’ll be at my own table at 3 Rivers Comicon in Pittsburgh. More details as this gets closer. This past weekend I hauled my carcass to New York to sit in with some cartoonist friends at MoCCA Fest — Manhattan’s largest independent comics, cartoon, and animation festival, run by the New York Society of Illustrators. Here I am with the legendary Arnold Roth. Always a pleasure hanging out with Arnie and his wife, Caroline. The jokes never stop. And here I am with Jason Chatfield and Ed Steckley. Ed was just nominated for a Reuben this year for his work on a children’s book about Rube Goldberg (the cartoonist who gives ‘the Reuben’ its name) And Jason (cartoonist for Ginger Meggs & The New Yorker) recently bleached his hair and did this ridiculous Selsen Blue commercial, so he’ll be known as “Dan Driff” for a while. Wednesdays just got good again! Lovin’ all of this. Don’t forget to send me tux photos for PSInside. Be sure to include Scout in his black bow tie. I thought you meant nervous for him accepting the award. I hope that truck IS filled with steaks, for Scout’s sake. But it’s probably not. Congrats on the nom! You deserve it!